What do teachers do after school? On Wednesday, January 28, the answer is they will be moonlighting at Oregano’ s Pizzeria and Ristorante in Newburyport for a PTA fundraiser. 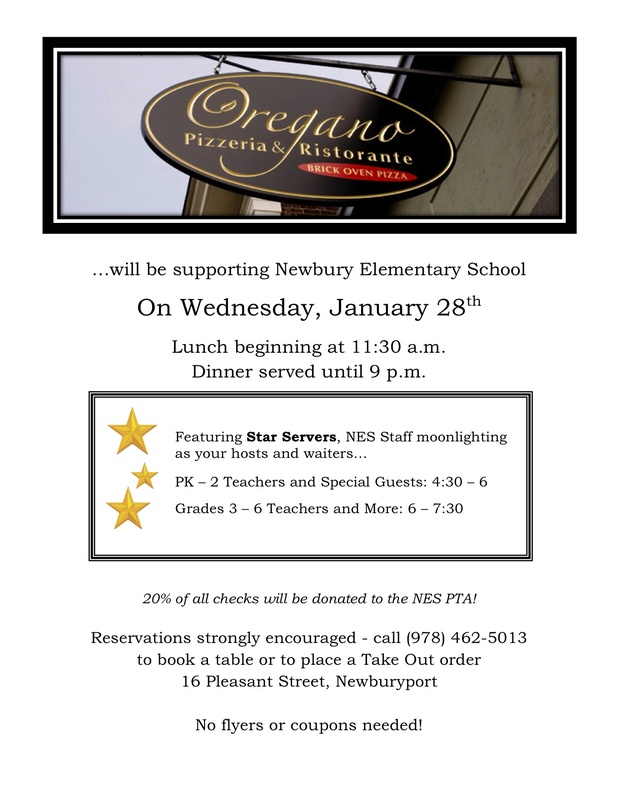 Oregano’s will donate 20% of all checks to the NES PTA on Jan. 28, 11:30 am to 9 pm. PreK-Grade 2 Staff and special guests will be moonlighting as hosts and waitstaff 4:30 pm to 6 pm and Grade 3-6 and surprise staff will work 6-7:30 pm. Come for dinner or an after school snack with the family or grab lunch with a friend. This night was a big hit and lots of fun last year. Reservations are strongly encouraged. Take out is available, too. Call 978-462-5013.